Well, thank God for that. (Not really. Just a point of interest about big chain being gobbled up by bigger chain.) Now, if we could maybe get some of the old neighborhood pharmacies and stores that have been driven out of business back? Or protect the handful that are struggling to hang on? Shop at Winn Discount on Court Street, nice people and great service! I quite like My Eckerd in Greenpoint in the old theatre. Comes complete with disco ball. And upscale imported European products. They stock there shelves full and have decent prices. Riteaid is a rip off and looks uncared for. I asked our Greenpoint store if it would be changing ie "would the precription Pharmacy remain the same?" As far as they know the manager stays.All remains the same. 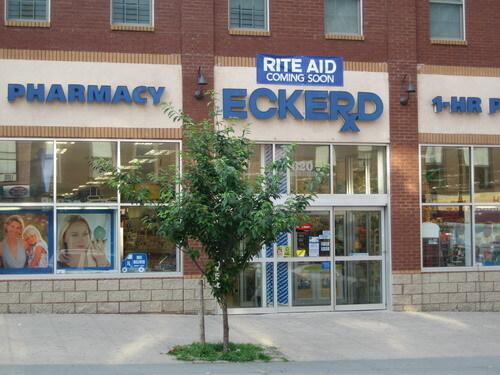 Products will be supplied from Rite Aid rather then Eckerd. They assured me that nothing would change. Let us see. If not it is off to the Polish Apteka.